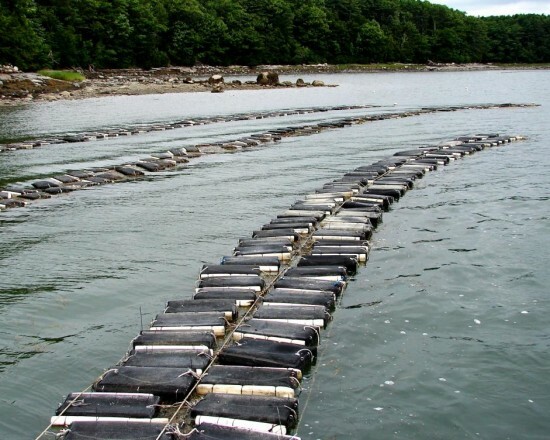 In the 1970s, companies in Blue Hill and on the Damariscotta River pioneered oyster aquaculture in Maine using rafts to culture European oysters (Ostrea edulis). Hatchery-produced seed oysters were reared to market size in Japanese lantern nets, stacked trays, or floating trays suspended in the water. Suspension culture, in which oysters or mussels are grown off bottom, in floating trays and on ropes, is a labor-intensive form of cultivation that requires continuous tending and cleaning of both gear and shellfish. Beginning in the mid-1980’s growers switched species to the native Eastern oyster (Crassostrea virginica) due to this species greater tolerance to extremes of temperature and salinity. At this time, researchers at the University of Maine initiated a selective breeding program to develop genetic strains of oysters more suited to Maine’s growing conditions. Oyster production begins in the a shellfish hatchery with the ripening of parental broodstock during the off season winter months. Parents are typically spawned in March and April with juvenile seed oysters available to industry growers in late May and June. Land-based or floating upwellers are commonly used for the initial growing stage to both protect the 2mm seed and to enhance growth by forcing nutrient-rich waters through the growing bins. Nursery culture of oysters typically includes rearing 10-50mm oysters in floating plastic cages tethered together in long strings. Surface cages can be regularly flipped over to air dry the undersides and thus control the accumulation of biofouling organisms. As the oysters grow in size, farmers regularly size-grade and thin their crop to to maintain optimal growing conditions. 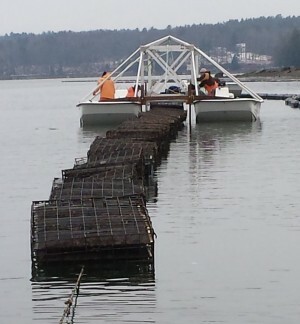 Often at the end of the first growing season, farmers will either bottom plant their crop or overwinter the oysters in cages or rafts until they can be redeployed the following growing season. 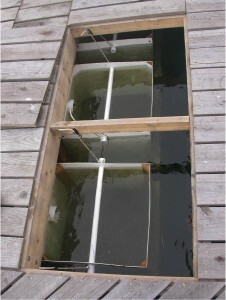 Similar to conventional crop farming on land, bottom culture involves selecting areas of the sea floor that provide a natural food supply, necessary currents, minimum exposure to predators, and proper temperature and then “seeding” the bottom with shellfish stock that are left to grow to market size. Then they are harvested by divers or with a bottom drag from a boat. In recent years, suspension culture methods have become a common way to rear the product to market size in surface cages but require greater capital expenditures and ongoing labor during the several years required to reach a market size. Both suspension culture and bottom culture depend on natural food supplies for growing the shellfish being raised. Today, about 80 oyster farms in Maine extend from York to Washington counties raising millions of oysters per year for the white table cloth market.